The smartfabgroup™ Mask Management System is a unique material management software designed for the managing of photolithography masks and reticles in semiconductor production fab. 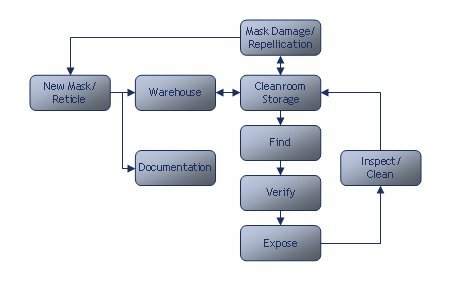 Easy to use for operators and powerful for engineers, it serves as a platform to control: the photomask usage, the mask verification, the storage (in cabinets and warehouses) and the regular cleaning/inspection of the masks. Regardless whether you use the reticles for the step-and-repeat systems or the 1x contact masks for the mask aligners, the smartfabgroup™ Mask Management System is the solution for the efficient maintaining of the masks in your photolithography area. by reducing the time spent for the mask searching. The graphical interface guides the operators quickly to the storage place with the required mask. The dynamic system always tracks the current location of the mask: in the storage place, in use, in the cleaning process or in the warehouse. The exposure systems are not idle anymore waiting with the wafers for the production mask to be found. Obsolete masks can be stored out of the costly production area and still easy to locate. by avoiding the mix-up of the masks. The bar code mask verification ensures usage of the correct mask in the accordance with the manufacturing execution system. The bar codes on mask boxes or directly in the mask layout can be used for the verification. The operator errors are reduced to minimum. by the regular controlled mask cleaning and inspection, the masks are always in an optimal condition for the exposure. An individual setup for each mask guarantees the most effective cleaning for critical and non-critical masks. and the work load for the mask cleaning by creating cleaning batches which can be sent to the mask shop for cleaning or cleaned locally. Keeping obsolete and low-usage masks out of the main clean room reduces the cost of the mask shelves, the footprint and the search time for the operators, while still guarantying an easy and fast localization. both for operators and engineers. 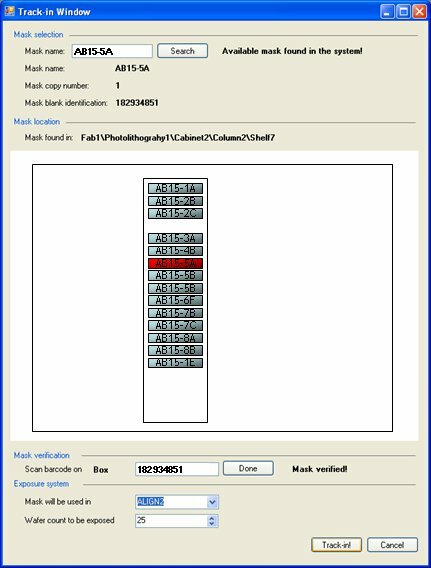 The smartfabgroup™ Mask Management System is the place to store all mask related data, like layout designs, comments and even shot maps. It is a source of the statistical data for optimizing the cabinets and the mask location, the cleaning cycles and the mask quantity. © smartfabgroup™ Company 2010. All rights reserved.